Last Thursday I posted a picture quiz, asking what people thought the photo in the right showed. I gave a clue that I photographed it at Kew Gardens. 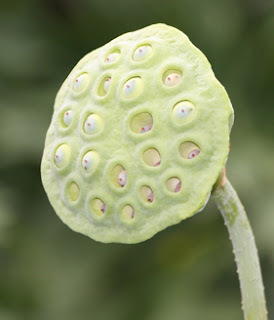 Well, most people guessed correctly - it is a seed head from a lotus flower. The photo at the top of this post shows a lotus in bloom. There were no prizes for guessing correctly, but you can congratulate yourself if you recognised it or came up with an entertaining alternative suggestion. Several people said it was a type of shower head and others suggested it had something to do with aliens. The lotus was in Kew's amazing Water Lilly House, which is well worth visiting. 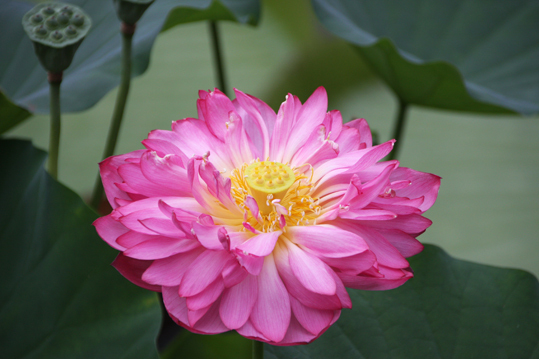 Lotus blooms represent purity and beauty in many spiritual traditions, particularly Buddhism and Hinduism. To the ancient Egyptians, the lotus represented the sun.